The final installation will consist of a portable custom-designed room that audiences can enter. 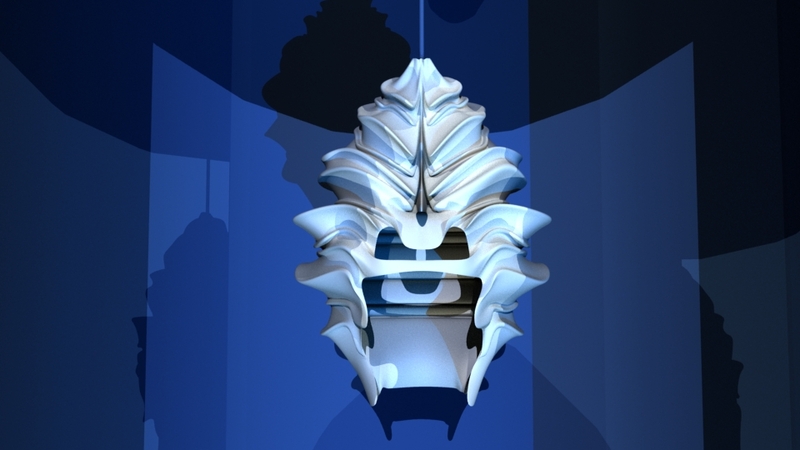 Inside, the shell-shaped headdress will be hanging from the ceiling. The headdress can be raised and lowered to accommodate people of different heights and abilities. Stepping inside, the viewer places their head inside the headdress and is immersed in sound. Cues in the music invite the viewer to gently move their head. As the viewer moves, the music will transform and shift. The effect is meditative and soothing. From the testing of the Minimum Viable Product, we will determine whether we will include a chair in the installation or if viewers will be standing. We aim to create an experience as immersive, innovative, and moving as the Rain Room by Random International. Such installations transform the way people imagine technology. Rendering of indoor installation of Bivalvia: Into the Shell, close up. Rendering of indoor installation, wide view. The indoor installation as imagined for spaces like museums, galleries, and event spaces. We are working with set designer Christina Tang (credits include: Lincoln Center, Rubin Museum, and Fringe Festival) to execute this vision successfully. Rendering of outdoor concept, close up. One concept we are currently exploring is an outdoor installation. Though technically more challenging, an outdoor installation could open the door to augmented interactions with the natural environment.